On many occasions I have read and heard dividend investors saying that it doesn’t matter much when you buy your dividend paying stock and if you invest regularly, in long term the prices will smooth into average anyway. However I like to wait for the stock I am interested in to pull back and buy the dip even though I am buying for the long term. It’s like a game for me. I believe that no stock would ever go up in a straight line and one day pulls back. A few days ago I wrote that the stock market is very extended and overbought and it may switch into correction any day. Thus I am in minimal buying mode and willing to buy stock which show pull back, breaking from a base, correcting no matter what the market does as long as such a pullback isn’t caused by bad fundamental data of the company. One of the stock I wanted to buy is Targa Resources Partners LP, but when I found this stock it was already too late for me to jump into this stock. it was running up and I missed the pull back late in December 2012. Would you be chasing the stock? It was very tempting for me to jump in. Targa resources pays nice dividend, as of this writing the yield is 6.30%. Targa Resources Partners LP provides midstream natural gas and natural gas liquid (NGL) services in the United States. The company operates in two divisions, Natural Gas Gathering and Processing, and Logistics and Marketing. Targa has recently acquired its first big foothold in the Bakken Formation in North Dakota. The pipeline operator recently raised its target for 2013 adjusted EBITDA (earnings before interest, taxes, depreciation and amortization) by 10% to 15% and kept its projections for distribution growth for 2013 over 2012 at 10% to 12%. The 5yr average dividend growth is listed at 30%, and 3yr. average at 7%. It has a history of 5 years of increasing the dividend and it pays dividends since 2007. From the chart above, you can see the stock running up with a strong break up from 200 day MA when the company increased its dividends. In my opinion this break was weak, because of previous long run up, so I was expecting a pull back. However, I was expecting it down to 200 day MA only and not such deep fall. Although this fall can be temporary and tomorrow the stock can reverse and march up, it still can continue further down to 50 day MA. So although the market is in Extreme Greed as per the chart at CNN Money, having a value of 92 of 100 at fear & greed index, you still can find dividend paying stocks (or wait for the stocks) at good current valuations worth buying as Dan writes on his blog. 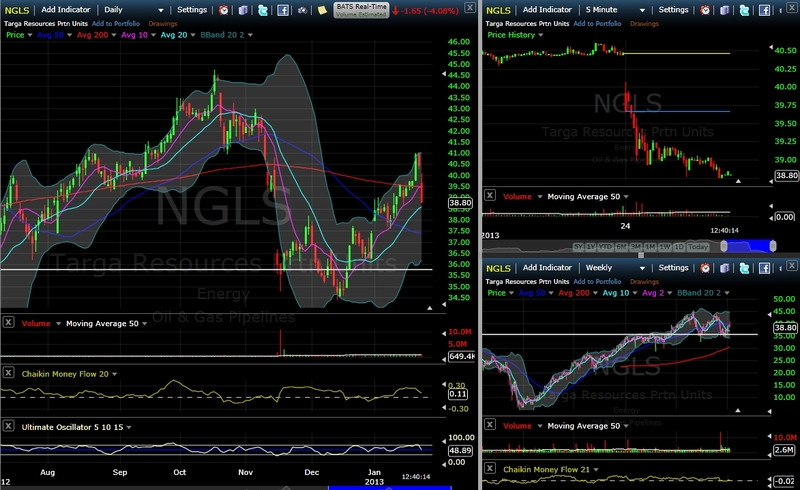 I think NGLS is now a stock worth buying. But the price can fall even further. Today’s price action can spark even more selling and profit taking. For that reason I am entering a contingency order to buy 25 shares of NGLS if the stock reverses and goes higher than $39.84 a share. If this doesn’t happen and the stock continues falling, the order will not execute and tomorrow I will move my buy order limit lower based on tomorrow’s new closing price. That will ensure that I will not buy on daily volatility, but when the stock reverses. This of course is not a bulletproof strategy of entering the position, but worked for me in many occasions.